Open a fabulous fashion boutique. In Dress Up Rush, Jane is back and ready to start yet another new business! She really gets around, doesn’t she? 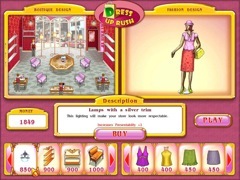 Now she’s entering the glamorous world of the fashion boutique. Of course our lovely business lady doesn’t want just any old clothing store, it's got to be a fancy boutique with great customer service! Upgrades such as comfy chairs, fashion magazines and relaxing music keep your clients happy and spendy while they shop from the newest fashion lines! Work you way up to international fashion fame in Dress Up Rush!